This small restaurant located in a strip mall in the Laguna Hills is unassuming and easy to miss but don’t be fooled by the simple facade. Hidden away is a fantastic place for special breakfasts created by former Ritz-Carlton Laguna Niguel executive sous-chef Dee Nguyen who decided to leave his hotel job to be able to spend more time with his wife and son. Now, less than two years later, his risk has paid off as Break of Dawn is loved by locals and packed on weekends for breakfast and brunch. The menu has several traditional breakfast dishes like oatmeal, pancakes, eggs Benedict as well as a selection of brunch/lunch items except that none of the renditions are typical as all the dishes are given a gourmet twist that make them unique. We ordered most of the menu as there were almost a dozen of us having breakfast. I chose my usual Eggs Benedict – two poached eggs over smoked ham on sun-dried tomato Focaccia with Holy Pesto Hollandaise – a modern take on the egg-yolk rich Hollandaise and served with crunchy spiced home fries. The herby pesto complimented the perfectly poached eggs and were delicious. A had the Steel-cut Irish oatmeal brule with walnut and brown sugar plus one of the brunch items – the coriander-cured smoked salmon with an oatmeal (instead of potato) galette, poached egg and a lemon-caper emulsion. I tasted both – the oatmeal was creamy and chunky with the walnuts while the smoked salmon went really well with the caper- flavoured sauce. My sisters ordered their usual: one had the chilaquiles ranchero – Chorizo and cheddar scrambled eggs with bacon baked beans, corn tortilla, guacamole and a spicy, creamy Epazote sauce while the other had the Portuguese-Hawaiian sausage with fried eggs, scallion puree, a tangy green papaya and sesame salad and fried rice. (This is very similar to a Philippine breakfast dish called long-si-log – a sweet-spicy sausage called LONGanissa, garlic-fried rice called SInangag and fried eggs, itLOG – hence the name). C had the Corned Beef Hash – slices of super tender fresh corned beef with sweet potato hash, tarragon braised cabbage and a grainy mustard sauce. His dad had his favourite creme brulee French toast – raisin and cinnamon brioche, a creamy Mexican chocolate and coconut custard with a caramelized sugar creme brulee-type topping. The kids shared a side order short stack of chocolate chip griddle cakes drizzled with chocolate sauce and powdered sugar. There are also two items on the menu for “Little Diners” – grilled cheese of mozzarella and cheddar and the peanut butter and Nutella in a blanket – griddle cakes with chocolate sauce and whipped cream. There were still so many dishes I wanted to try on the menu like the cinnamon bun baked in a cast-iron skillet and drizzled with coffee syrup and almond glaze or one of the many-flavoured griddle cakes on offer like the pineapple coconut or the cinnamon or the Vietnamese-style meatloaf with buttermilk cheddar biscuits or the seasonal fresh fruit plate with the walnut-carrot coffee cake – the list of yummy things goes on and on. 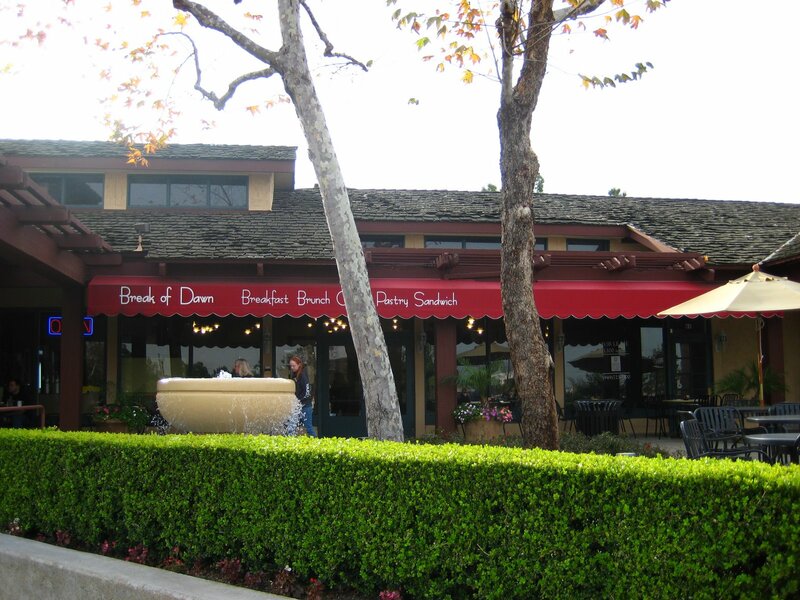 Break of Dawn is the perfect place to greet the morning with their lovely breakfasts and gourmet brunch concoctions. My next visit to Laguna Beach will definitely include a stop at this one-of-a-kind restaurant. *Open from Wednesdays to Sundays from 8:30 a.m. to 2:30 p.m.
Hi Carolyn,Thanks for all the restaurant suggestions. We're always looking for new places to try. I'll let you know when we're next in Laguna and we can definitely meet up for a coffee by the beach :)G.T. Thanks for checking in Danielle! I love breakfast as well and Break of Dawn has been the best breakfast I’ve had in years.G.T. Thanks Tanats!!! It was really yummy and even if my eggs benedict were very good, I wished I ordered the longsilog instead.G.T. omg!! the longsilog looks soooo good!! !